When you need to scan a document for translation, you can skip the search for a friend or business with a scanner because you can scan documents for free using your smartphone or tablet. How does it work? A program or app on your phone performs the scan using your camera and, in many cases, converts it to a PDF automatically for you. You can also use your tablet to scan documents; however, when you’re on the go, a phone scan is often the fastest and most handy option. Tap the icon of a square with a pencil in it to create a new note. Tap the circle with the + in it. A menu appears above your keyboard. In that menu, again tap the circle with the + in it. Position your phone’s camera over the document to be scanned. Notes will automatically focus and capture an image of your document or you can control this manually by tapping the shutter button yourself. After you have scanned a page, Notes will show you a preview and provide the options to either Keep Scan or Retake. When you have finished scanning all pages, you can review a list of your scanned documents in Notes. If you need to make corrections, such as cropping the image or rotating the image, simply tap the image of the pageyou want to correct and it will open that page with editing options displayed. When you are finished with any corrections, tap Done in the upper left corner to automatically save your adjusted scan. When you’re ready to lock the scan down as a PDF, tap the Upload icon. You can then choose to create a PDF, copy to another program, and so on. Tap Create PDF. The PDF of your scanned document will open in Notes. Notes will bring up the option to Save File To. Select where you would like your PDF file saved to, then Tap Add. Your PDF is now saved in the location you’ve selected and ready for you to attach and send out. Once you’ve scanned your document and have it saved in your preferred location, you’re ready to attach it to an email and send it along like any regular attachment. From your email program, start composing a new email message. From that message, select the option to add an attachment (often a paperclip icon). Navigate to the location you selected to save your PDF to, such as Google Drive, or your device. If you have difficulty locating your scanned document, check in the Files folder. The Files folder is a feature released in the iOS 11 update. If you have several documents in your Files folder, you can use the Search option to locate your desired file faster by file name. Select the document you want to attach and it’s ready to email. Tap the circle with the + inside it. Tap Scan (label is under the camera icon). Position your phone camera over the document to be scanned and tap the blue shutter button when you are ready to capture the scan. Drive will automatically open a copy of your scan. You can adjust your scan using the options on the top right of the screen to crop, rotate, rename, and adjust color. When you’ve finished with your adjustments, tap the check mark. Drive will present a preview of your adjusted document. If it looks good, tap the check mark again and the PDF of your scan will automatically be uploaded to Google Drive for you. Sending a scanned document from Android requires only a couple of quick steps. From your email program tap Compose to begin a new email message. Tap the paperclip to add an attachment and choose the option to add an attachment from Google Drive. Locate your scanned PDF and select it to attach it to your email. Finish and send your email per usual to send your scanned document. Alternately, you can download a copy of your scanned document to your device. If you are attaching a document you have downloaded to your device, on most Android devices, downloaded PDFs are usually stored in Downloads. If you prefer to use a scanner app to scan and create PDFs of documents, Adobe Scan is available for free for both Android and iOS. This app does offer an in-app subscription purchase to access additional features and options. However, the free version includes all of the features needed to cover the needs of most users. While there are quite a few scanner apps out there such as Tiny Scanner, Genius Scan, TurboScan, Microsoft Office Lens, and CamScanner to name just a few, Adobe Scan has all of the basics covered in the free version and is easy to navigate and use without much of a learning curve. If you haven’t already registered for an Adobe ID (it’s free), you’ll need to set one up to use this app. Open Adobe Scan. You may need to log-in with your Adobe ID when you use the app for the first time. 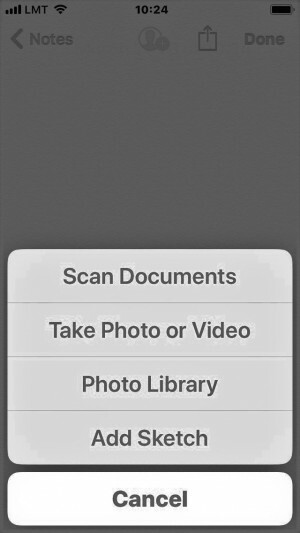 Adobe Scan automatically opens in scanning mode using your phone’s camera. However, if for some reason this doesn’t happen, tap the camera icon in the lower right corner when you are ready to scan a document. Position camera over the document to be scanned. The scanner will focus and capture the page automatically. You can scan multiple pages by simply switching out the page, and the program will capture pages automatically until you tap the thumbnail imagein the lower right corner. Your scan will open in a preview screen that allows you to make corrections such as cropping and rotating. Tap Save PDF in the upper right corner and the PDF of your scan will be automatically uploaded to your Adobe Document Cloud.